So I read some article and decided to share it on Twitter. I used the button placed conveniently, and the popup box had several options to configure. It was distracting, and by the time I hit tweet, I realized that there was a checkbox pre-selected to enter me for an iPad giveaway. Like so: Please note that this screenshot is from a link I opened from the spam trail on Twitter (to grab a screenshot), not the original article I tweeted. Which also means that this is the format of the box, not something the individual blogger had done. Note the configurable options and lack of url that you will be tweeting. If you see this, you can’t actually do anything with the link you are tweeting or see the shortened url that gets posted. All that you know is that whatever it is, the link will “eventually” reach the url mentioned. 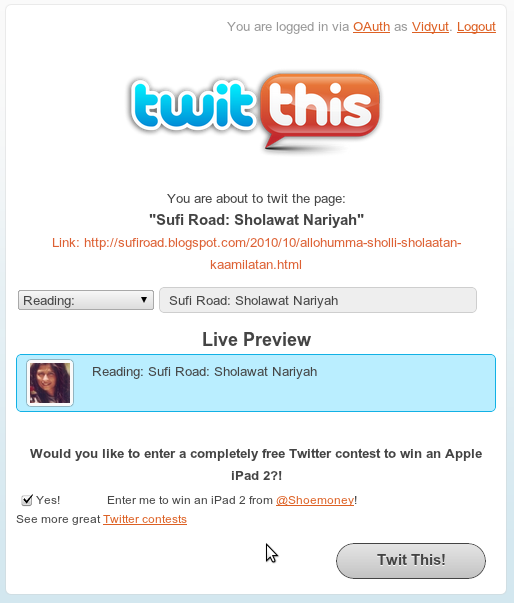 Compare with other url shorteners where your link gets added to the text box and you can write your tweet around it. I wonder why go through the extra effort to set it up like this, but never mind that. Read lower right column carefully. You can divert traffic. If you read the bottom right column, it says that you can point your short links to variable sources. Now, the thing is, you have your account advertizing for some dubious practice where you can get people to RT a very nice link, and when it goes viral, you switch it to something that earns you money? 1. Tweeting from my account without permission. 2. Tweeting advertizements of dubious ethics from my account without permission, so it isn’t just about permission, it is about my reputation too! I have credibility among followers that gets shot if I have tweeted this to them, or if anyone has RTd a tweet that gets swapped for something shady. 3. Subscribing to someone’s account without me knowing. Now, there is a link there that says see more great Twitter contests, which may possibly contain the info that entering the contest involves sending out the tweet and following the account or something, but it is definitely not clear on the popup for sending the tweet that your account will be doing things you have not authorized. It seems like a minor thing, but it is fraudulent. For one, this @shoemoney account’s promotions will end up in your (and many other people’s) timeline to get clicks, etc. For another, this account is able to charge more for any advertizing it does, because of the fraudulent follower count. You may get links to dubious destinations, you may end up unwittingly promoting unethical practices – at the cost of your own credibility. The mention of entering contest for iPad itself is not something you opted for, but something already selected, which seems harmless enough and possibly even not noticed by regular tweeters who see the button more as a quick facility than something to watch what they are signing. In other words, this is a misuse of Twitter. But is he really popular if sending a tweet adds followers without them knowing? Now, this account has 143,676 followers. Very impressive, except… not. It would be really impressive to have so many followers, and I’m sure some are legit, but when using a button to share a post on Twitter gets you subscribed to this account – unknowingly – then it is more of a measure of how many people got conned into this. If anyone from Twitter is reading this, please take action against this account. The rest of you, if what I said makes sense, mark this account for the spam it is.